Kate Lyon, the teacher-librarian at Lax Kxeen Elementary School, expresses her vision to "bring community into the schools". School’s out for summer and teachers are taking a much deserved break before the embracing the new curriculum and working with the district’s shrinking budget. Kate Lyon, the teacher-librarian at Lax Kxeen Elementary School, took the time to share her story before taking off on holiday with family. Lyon is an example of one of the teachers in this community whose mission is to add a little extra oomph into everything she does for her students. A recent example is when she brought Snake Days back to Lax Kxeen for a second year in coordination with Leanne’s Pet Shop. Snakes and lizards made a guest appearance in the library in front of wide-eyed children who had many questions. “I think being a teacher-librarian, you have a responsibility within the library and within the school that extends far beyond the four walls. It’s about building those relationships,” Lyon said. The born and raised Rupertite has spent much of her life building those relationships within the community, from working at one of the canneries to fund her education to taking piano lessons from Sandy Jones, now the superintendent of School District 52. Lyon left the north to major in piano at university and to become a secondary school music teacher but she saw how all encompassing that lifestyle would be and her heart was set on having a family. She switched gears and went into the elementary program, however when she returned to the North Coast she taught piano in the community for more than 20 years. She’s still called “the music teacher” by kids even after she gave it up. Fresh and ready to teach after her degree, Lyon taught at Annunciation School for her first year and then she subbed in Kitkatla until she was offered a full-time position teaching high school in the village. “At that point in my life I was really wanting some solitude,” she said adding that it was a good fit for her. Full of gumption and without the commitments of a family — yet — she felt it was some of her best teaching years. She put her piano skills to use in the tight-knit community and played at weddings and funerals. She said she felt accepted in a place where teachers often come and go because she was willing to share her gifts and her time. All the while, she was in a long-distance relationship with a man she’d met when she returned to Prince Rupert for a brief visit after her first year of university. Three years in Kitkatla, Lyon found another job in the city, and married Graham Stevens, whose family is originally from the Nass Valley. They had three girls, Sera, 12, Jayne, 10 and Anna, 7, and Lyon found balance and time for her family by choosing to work part-time. In the past two years, Lyon has worked in Lax Kxeen’s library. 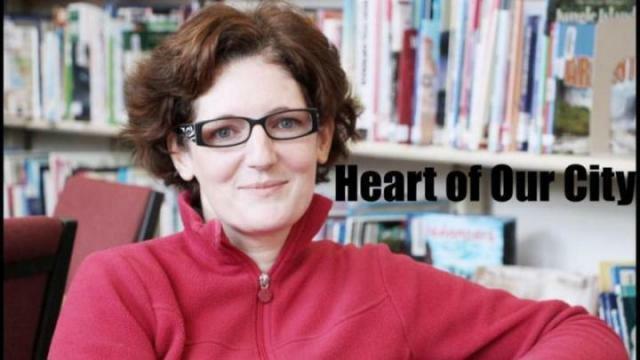 When she first started Lyon said the library was cluttered and uninviting with books and shelving adopted from Seal Cove Elementary School after it closed down. After speaking with parents and doing some research she came up a plan to create a more positive space that includes more inspired educational activities. The library now has shelving for fictional books that is at the student’s eye level. She also assisted in a parent lead project to build a library reading castle out of tubes and cereal boxes. The students themselves are also producing their own books. In the new school year, Lyon’s role is expanding. She is still the teacher-librarian at Lax Kxeen but the amazing work she’s done over the past two years has the school district wanting her to do the same in other libraries in the region. “Because of all the budget cuts we have to be more creative in our approach and maybe think outside the box on how we can approach some of the challenges that we have,” she said. Another project Lyon is involved with is the Rupert Syrian Refugee Support. She helped lead Cupcake Day, a fundraiser in schools across the district that raised more than $6,500 to bring a Syrian refugee family into the community. It wasn’t all about sweets, she also included an information package for schools to teach students about the Syrian crisis. The support group announced recently that they are expecting a Syrian family of seven to resettle in the community either in August or September. The four children will be entering the school system, and because of Lyon’s initiative, students in the district are more aware of their story and where they come from.